Hi! In setting ATLAS 2.6.0 I came across this error in loading the page in Chrome browser. Would like to see if anyone has a solution or has encountered similar issues? It’s strange that it can’t find the files (the 404 error means file not found). 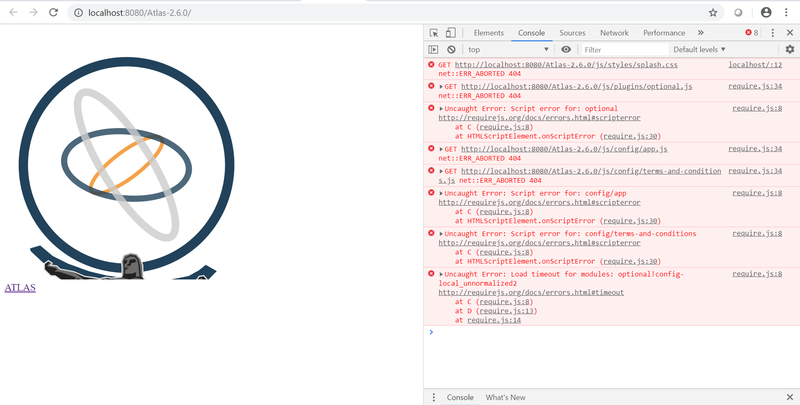 The browser’s URL looks like it found an index.html from localhost:8080/atlas-2.6.0/index.html, but it couldn’t find the assets under the root, such as /js/styles/splash.css. How did you set up the 2.6 Atlas folder? Did you run npm install and npm run build? Yes, I think I downloaded the 2.6.0 file and and added in the js/config-local file without using npm build. After that I downloaded Atlas 2.7.0 from https://github.com/OHDSI/Atlas/releases and followed the instructions to run the npm command and this version it is working now.